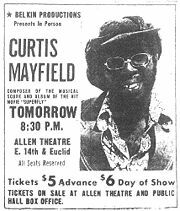 Curtis Mayfield (June 3, 1942 – December 26, 1999) was an American soul, funk, and R&B singer, songwriter, and guitarist. He was also a bassist, pianist, saxophonist, and drummer. Mayfield entered the hit music scene as the lead singer of the Impressions, recording such hits as "Keep on Pushing," "People Get Ready," and "Amen." He then pursued a solo career and also created a significant body of work as a producer and movie sound-track writer. Mayfield also composed the soundtrack to the blaxploitation film Superfly, considered by many to have been a landmark statement of black consciousness, which has influenced many subsequent artists. He thus came to be highly regarded as a pioneer of funk and of politically conscious African-American music. He left his imprint on the 1970s by couching social commentary and keenly observed black-culture archetypes in funky, danceable rhythms and was credited with introducing social comment to soul music. After suffering a tragic stage accident that left him paralyzed from the neck down, Mayfield continued to work as a producer and even published an album of vocals, "New World Order." He died in 1999 from complications of his disability and diabetes. Mayfield was inducted into the Rock & Roll Hall of Fame on March 15, 1999. Born in Chicago, Illinois, Mayfield attended Wells High School, although he did not graduate due to his pursuit of a musical career. In 1956 he joined The Roosters with Arthur and Richard Brooks and Jerry Butler. Two years later, The Roosters, now including also Sam Gooden, became The Impressions. The band had hits with "For Your Precious Love" and "Gypsy Woman." After Butler left the group and was replaced with Fred Cash, Mayfield became lead singer, frequently composing for the band, as well. "Amen," an updated version of an old gospel tune, was included in the soundtrack of the 1963 MGM film Lilies of the Field, which starred Sidney Poitier. The Impressions reached the height of their popularity in the mid to late 1960s, with a string of Mayfield compositions that included "Keep On Pushin'," "People Get Ready," "Choice of Colors," "Fool For You," "This is My Country," and "Check Out Your Mind." Mayfield had written a number of songs that were adopted by the Civil Rights Movement in the early 1960s, alongside Bob Dylan and others, but by the end of the decade he was a pioneering voice in the black pride movement, in the company of James Brown and Sly Stone. Mayfield's "We're a Winner" became an anthem of the black power and black pride movements when it was released in late 1967, much as his earlier "Keep on Pushing" had been an anthem for Martin Luther King, Jr. and the Civil Rights Movement. Mayfield had several distinctions to his style of playing and singing, adding to the uniqueness of his music. 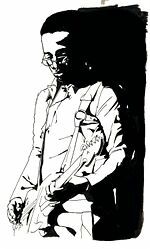 When he taught himself how to play guitar, he tuned the instrument to the black keys of the piano, giving him a modified open F-sharp tuning—F#, A#, C#, F#, A#, F#—that he used throughout his career. Also, Mayfield sang most of his lines in falsetto (not unique in itself, but other singers in his time mostly sang tenor), adding another distinctive flavor to his music. In 1970, Mayfield left The Impressions and began a solo career, founding the independent record label Curtom Records. Curtom would go on to release most of Mayfield's landmark 1970s records, as well as records by the Impressions, Leroy Hutson, The Staple Singers, and Mavis Staples, and Baby Huey and the Babysitters, a group which at the time included Chaka Khan. Many of these records were also produced by Mayfield. The commercial and critical peak of Mayfield's solo career came with his 1972 album Superfly, the soundtrack to the blaxploitation film of the same name, and one of the most influential albums in history. Unlike the soundtracks to other "blaxploitation" films (most notably Isaac Hayes' score for Shaft), which glorified the excesses of the characters, Mayfield's lyrics consisted of hard-hitting commentary on the state of affairs in black urban ghettos at the time, as well as direct criticisms of several characters in the film. Along with Marvin Gaye's What's Going On and Stevie Wonder's Innervisions, this album ushered in a new socially conscious, funky style of popular soul music. Mayfield was dubbed 'The Gentle Genius' to reflect his outstanding and innovative musical output with the constant presence of his soft yet insistent vocals. Superfly's success resulted in Mayfield being tapped for additional soundtracks, some of which he wrote and produced while having others perform the vocals. Gladys Knight & the Pips recorded Mayfield's soundtrack for Claudine in 1974, while Aretha Franklin recorded the soundtrack for Sparkle in 1976. Mayfield worked with Mavis Staples on the 1977 soundtrack for the film A Piece of the Action. One of Mayfield's most successful funk-disco meldings was the 1977 hit "Do Do Wap is Strong in Here" from his soundtrack to the Robert M. Young film of Miguel Piñero's play Short Eyes. During the late 1970s, he was able to produce a remarkable output as a writer, producer, performer, arranger, and businessman. Mayfield was active throughout the late 1970s and 1980s, though he had a somewhat lower public profile. On August 13, 1990, Mayfield was paralyzed from the neck down after stage lighting equipment fell on him at an outdoor concert at Wingate Field in Flatbush, Brooklyn, New York. This tragedy set him back significantly. He was unable to play guitar, but he wrote, sang, and directed the recording of his last album, New World Order. During this time he invited the legendary guitarist, Edmund Darris, to his home in Atlanta to create tracks for Mayfield's "New World Order" album. Due to his disability, Mayfield's vocals were painstakingly recorded, usually line-by-line while lying on his back. In February, 1998, Mayfield had to have his right leg amputated due to diabetes. Mayfield died on December 26, 1999, aged 57, in Roswell, Georgia surrounded by his family. His last work was the song "Astounded," with the group Bran Van 3000, recorded just before his death and released in 2000. Curtis Mayfield is remembered for his classic recording with the Impressions, his introduction of social consciousness into R&B, and for pioneering the funk style in the 1970s. Several of his recordings with the Impressions became anthems of the Civil Rights Movement in the 1960s, and his most famous album, Superfly, is regarded as an all-time great that virtually invented a new style of modern black music. It holds the number 69 spot on Rolling Stone's list of the 500 greatest albums. Mayfield's distinctive riffs influenced the development of funk; he is also regarded as influencing other landmark albums, like Herbie Hancock's Head Hunters. He is highly regarded for his numerous innovations in the 1960s and 70s and for his unique style of music. In 2004, Rolling Stone Magazine ranked Mayfield number 99 on its list of the 100 Greatest Artists of All Time. Hip-hop producer Just Blaze has used a slowed-down sample of Mayfield's "Move On Up" for Kanye West's single "Touch The Sky." Eminem sampled Mayfield's song "Pusherman" for his debut LP on the song "I'm Shady." Rapper 2Pac sampled him consistently as well. Ice-T's song I'm Your Pusher includes a sampling of Mayfield's "Pusherman." Contemporary Jamaican music was profoundly influenced by Curtis Mayfield's body of work. The Techniques, The Uniques, Bob Marley and the Wailers, and many other early vocal groups in Jamaica were deeply influenced by the songwriting, vocal harmonies, and black consciousness which were the hallmarks on Impressions recordings from the early to mid-1960s. Many of the Wailers early ska recordings are Impressions covers. One of Marley's most well known songs, 'One Love' (Studio 1, 1965), is reworking of Mayfield's gospel-soul classic, "People Get Ready." Mayfield received the Grammy Lifetime Achievement Award in 1995. He was inducted into the Rock & Roll Hall of Fame on March 15, 1999. Unfortunately, health reasons prevented him from attending the ceremony, which included fellow inductees Paul McCartney, Billy Joel, Bruce Springsteen, Dusty Springfield, George Martin, and labelmates The Staples Singers. As a member of The Impressions, Mayfield was posthumously inducted into the Vocal Group Hall of Fame in 2003. This page was last modified on 22 November 2017, at 21:30.